If you are using an autoresponder to build your list, do you use broadcast emails or follow up emails feature more frequently? Most industry standard autoresponder will have both features. They are important keys to email marketing. Ultimately, email marketing is about sending emails. And you will using these 2 features to email your subscribers. What is the difference between both and when is the best time to use broadcast or follow up emails? In this post, let’s dive deep into the topic and discuss about them. First, I always encourage my students and customers to build their own list so that they can have a sustainable internet business. The beauty of having a list allows you to be able to communicate with your subscribers by emailing them with new content and offers. Sometime, you also can ask them questions and get them to reply you. 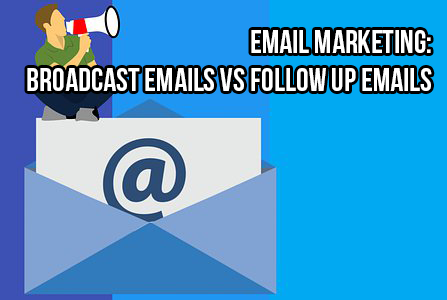 This is when you need to know the main difference between a broadcast email and follow up email. Follow up emails are usually pre-set to include the welcome emails and a few more follow up emails and that send out at a regular interval to continue to communicate with your new subscribers. You need the Follow Up Email feature in order to send out the welcome emails instantly when a new subscriber join your list. This cannot be done using the broadcast function. As the name Follow Up Email suggests, this feature allows you to prepare the emails beforehand and the autoresponder will send them out based on the schedule that you have set up. So how many emails should you prepared when you first started out? There is no hard and fast rule about this. However, it is best that you include at least 3 to 5 emails including the first welcome email. It is also perfectly fine to prepare lots of emails, even up to hundreds of them and let the autoresponder do the job of sending them to your subscribers. The key advantage here is automation. If you prepared lots of emails and loaded them in your follow up email sequence, then you do not need to come back frequently to add more emails or send broadcast emails. Broadcast email feature is actually sending the email instantly. Although at times, you also can schedule the broadcast to go out at later time. For example, you want to promote a product launch that is happening in a few hours time but you will not be able to login to your autoresponder at that time. So you set up the broadcast email now but schedule it to send out at the launch time. Broadcast email is perfect for sending current hot offers and content to your subscribers regardless of which stage of the follow up email sequence they are at. Lots of marketers including myself, prefer to send out broadcast emails. As mentioned earlier, we like broadcast emails as we can communicate with the subscribers on the current topics and engage them. It is difficult to do that for follow up emails as the subscribers come in at different time. In addition, for broadcast emails, you can send emails to the same group of subscribers again based on their action taken. For example, you can send the email to the same group of subscribers who opened and read your email but did not click on the link to check out the offer that you are recommending. You want to only send email to this segment of your subscribers to remind them about the amazing offer. Hence, broadcast emails are able to be delivered to a specific segments of your subscribers. This helps to also build the relationship with the subscribers and also learn more about them. So I hope you have a better understanding of what broadcast emails and follow up emails are about and when to use them. Let’s me know when do you use follow up emails and broadcast emails and what do you like about them in the comments below. Thank you and talk to you soon!